This month the Wister Center received the Green Building of America award. This award is given by Real Estate and Construction Review to projects that are “unique and challenging,” projects other architects could “learn from” with advanced “design, construction and technology” and a project the board feels is “cutting edge,” according to Lance Kamin, publisher. 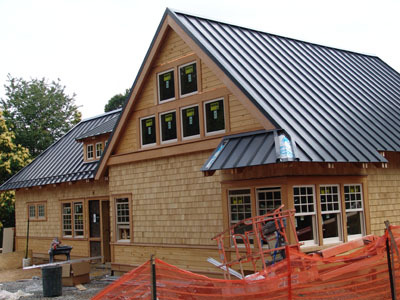 The Wister center was selected from more than 2,500 nominated projects and will be spotlighted in the special Real Estate & Construction Review-Northeast Green Success Stories edition in 2010. Check out the article in Delaware County Daily Times to learn more. To see ongoing photos of construction on Wister Center, visit the Scott Arboretum’s facebook page. Learn more about our efforts to receive LEED silver certification on the Wister Center here. Thanks Ann. We are excited begin using the space as well. They just painted around the windows today. It looks good. I tried to find your video showing how the green roof was constructed. Where is it or does it exist? Follow the below link for complete list of links to videos about the green roof construction. Hey – the new greenhouse and education center looks fantastic! Can’t wait for the opening party! Thanks Shari. Rhoda just posted some great new photos of the greenhouse floor and the progress inside the building on our facebook page. Congrats on the award. You are making strides to be the top in your field.